A majority of teens own an iPod, many use iTunes, and more than one in five intend to purchase an iPhone in the next six months, a new survey has found. Apple's smallest market among teens —the iPhone —is poised to greatly expand. While 15 percent of those surveyed currently own an iPhone, 22 percent intend to purchase one in the next six months. "We believe the $99 iPhone 3G has been a meaningful part of share gains in the last six months," Senior Research Analyst Gene Munster said. "Previously, teens were indicating that the plan pricing and handset pricing were too high for them (and their parents) to buy iPhones. The lower pricing appears to have been a catalyst for share gains." Apple has maintained its utter dominance of the portable media player market, with an 87 percent total share, up from 84 percent one year ago. Coming in second was Microsoft with 3 percent, followed by Sony with 2 percent. Those who plan to buy overwhelmingly choose Apple as well, though Microsoft's share of that question grew significantly. 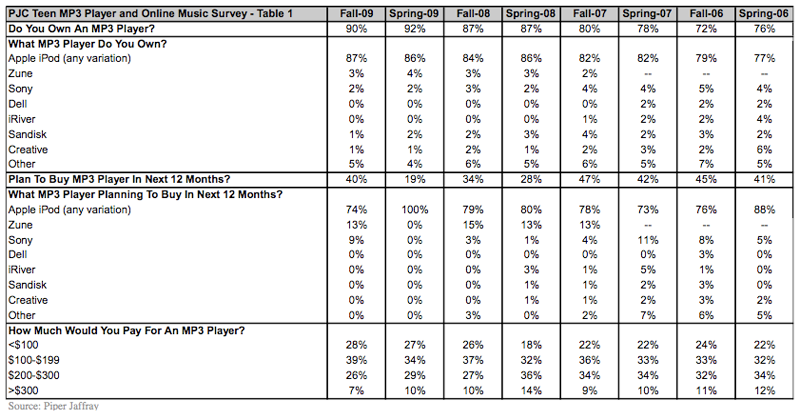 Of those who plan to buy a media player in the next 12 months, 74 percent said they will choose an iPod, while 13 percent said Zune, and 9 percent opted for a Sony product. "Apple's dominance in the PMP market remains largely unchecked," Munster said, "and it is clear to us that Apple has captured the 'cool factor' among high school students across America." Only 40 percent of surveyed teens legally purchase music online. But of those that do, a whopping 93 percent said they use iTunes to purchase songs. That's the same total from one year ago. The next-largest provider is Rhapsody, with 2 percent. But 57 percent of teens use peer-to-peer networks to download pirated music. While still high, that's down from 64 percent two years ago. Piper Jaffray has maintained its overweight rating for AAPL stock and price target of $235 per share. "We believe that the teen demographic is a critical component of long-term growth in the digital music and mobile markets," Munster said, "and Apple is taking its leading position in music and mobile markets."